materials: acrylic crochet yarn medium size, 4mm crochet hook. Round 1: wrap the yarn twice on you middle fingers, hold the tales together and make a slip stitch, chain 3, 2 double crochet into the hole, chain 2, 3 double crochet into the hole, chain 2, 3double crochet into the hole. pull the tale out, grab the inside yarn and pull it tightly, grab the tale and pull it tightly, chain 2, slip stitch to the 1st stitch. crochet into the hole, chain 3, 3double crochet into the same hole, chain2, skip next stitches, 3double crochet in to the hole, chain 3, 3double crochet into the same hole, chain 2, slip stitch to the 1st stitch. Cut the yarn, finish your work and hide the tales. 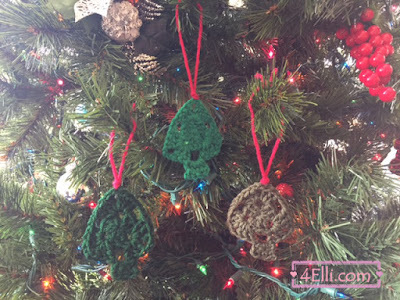 You Can watch our video tutorial witch shows you how to make this beautiful ornament step by step.